Take a look at your Desktop, or the Downloads folder - is it a little disorganized? Or maybe really disorganized? Don't worry, it's really easy to clean up. 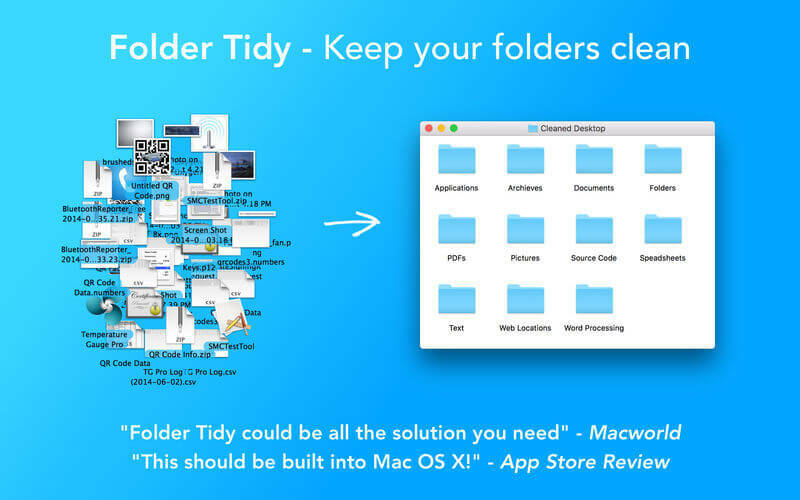 Download Folder Tidy right now and choose the folder to organize and with one click you'll see the files get sorted into the appropriate sub folders (Pictures, Word Documents, Numbers, Archives, etc). Need a little more control? 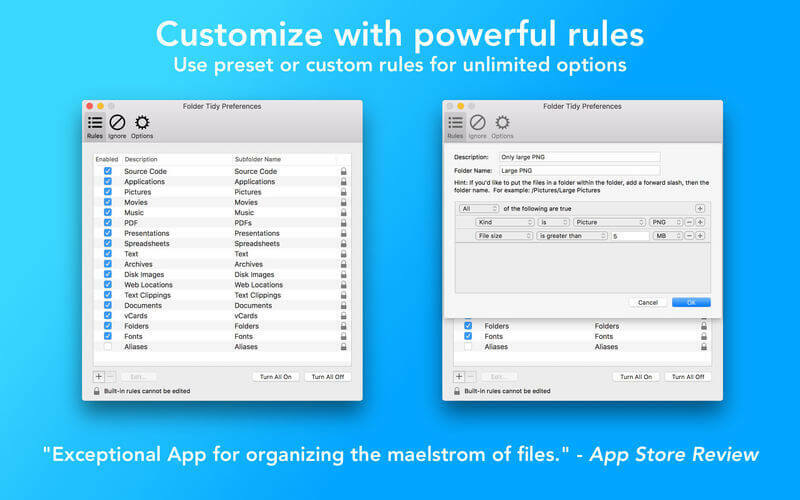 Open up the preferences, change the order of the built-in rules, or start to make custom rules. Use the powerful predicate editor to make pretty much any rule you'd like. For example, create a rule to move all photos with a size bigger than 5MB and older than a year into a folder. Pretty neat, eh? [Updated] The UI/UX of the app - almost everything has been improved! [New] Progress window shows the current number of files tidied. [New] Finished window shows the total number of files tidied and the total time it took. 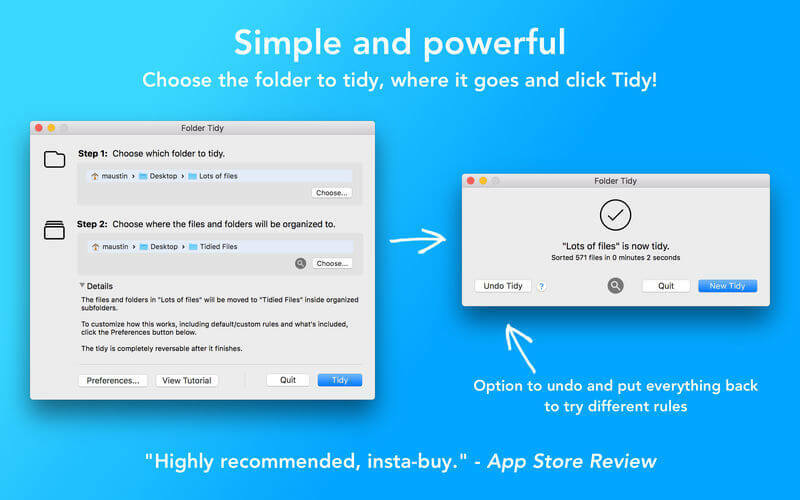 [New] Finished window has a button for starting a new tidy without having to re-launch the app. [New] The state of the details disclosure triangle is now persisted across app launches. [New] About window now shows the email and license key for easy access. [Fixed] Issue where if the app couldn't access the last chosen folders, it would try anyways and show an error dialog about not having access. Now it displays a warning and will not allow a tidy until a new folder is chosen. [Fixed] Issue where the app would become unresponsive when running a tidy. [Fixed] Issue where the progress window could become hidden.